by jessicasabo March 11, 2018 . 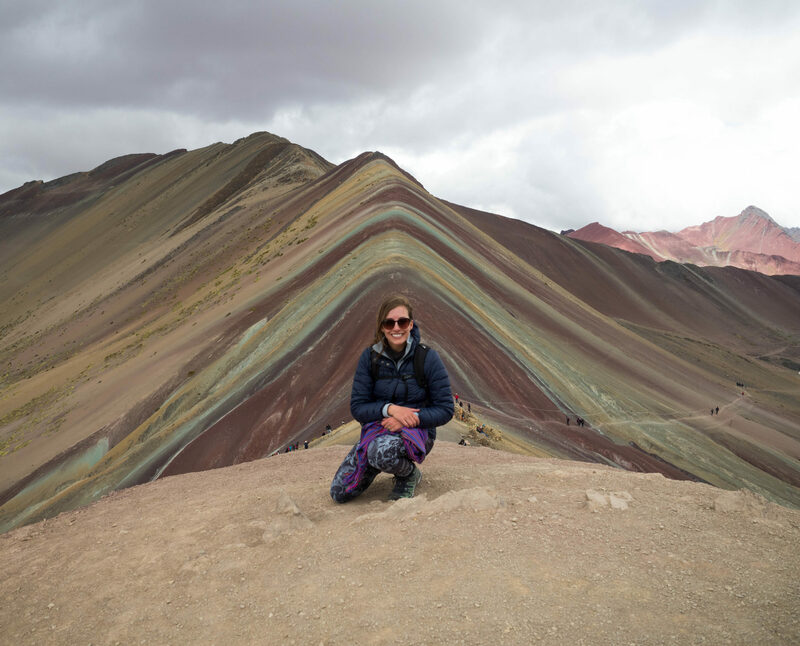 The rainbow mountain of Peru is located in the Ausangate mountain region of the Andes. This area was only recently discovered by tourists in 2015 and the first guided tour began in 2016. 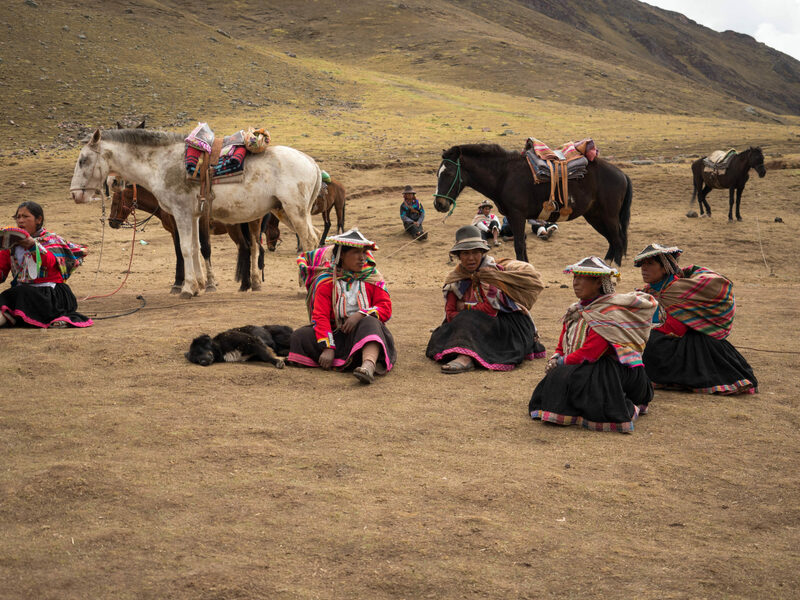 Considered holy by the locals, some worship daily at the site and bring offerings to the gods. 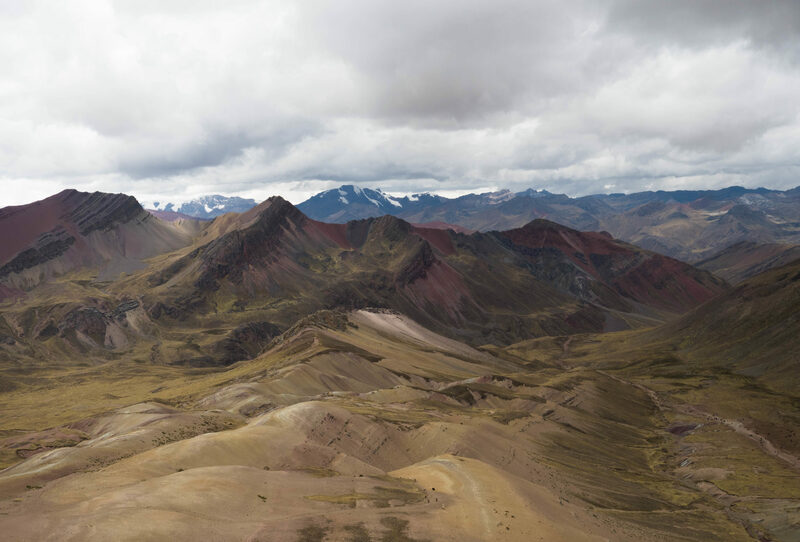 The peak elevation of rainbow mountain is 17,100 feet, which is almost as high as Everest base camp coming in at 17,600 feet! How did the rainbow form? It’s a complicated geological phenomenon and one that I don’t fully understand to be honest. After reading a few articles I’ve come to the conclusion that the colors are formed from a combination of weather conditions and mineralogy. Tectonic plates collided forming the uplift of the mountain range, volcanism started, and then rare minerals were introduced into the soil. You know, basic stuff 🙂 As you scan the colors you’re actually seeing the result of millions of years of history right before your eyes. 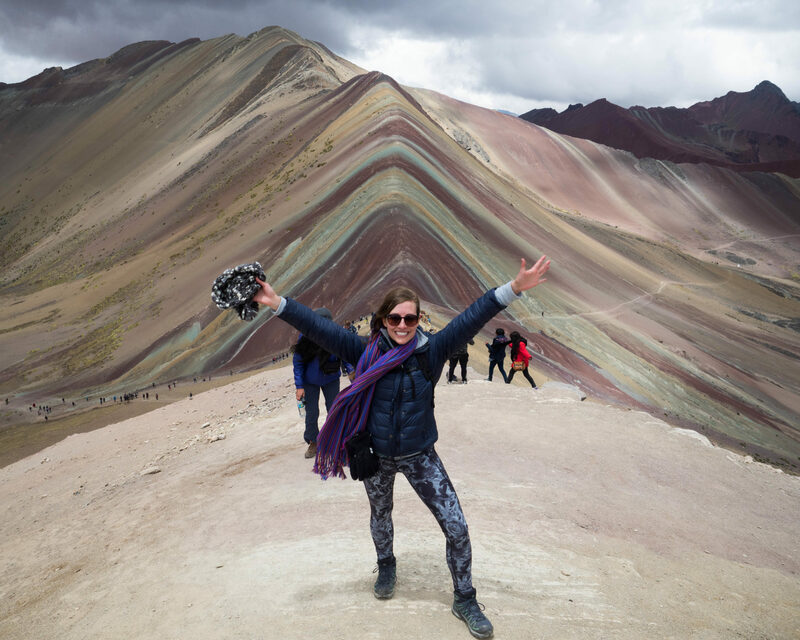 The easiest way to get to rainbow mountain is to book a day trip with one of the many tour companies in Cusco. They handle all the travel logistics for you, and it’s about a 3-hour drive. During the drive, you’ll pass through some local villages and see some incredible views of the mountain range. 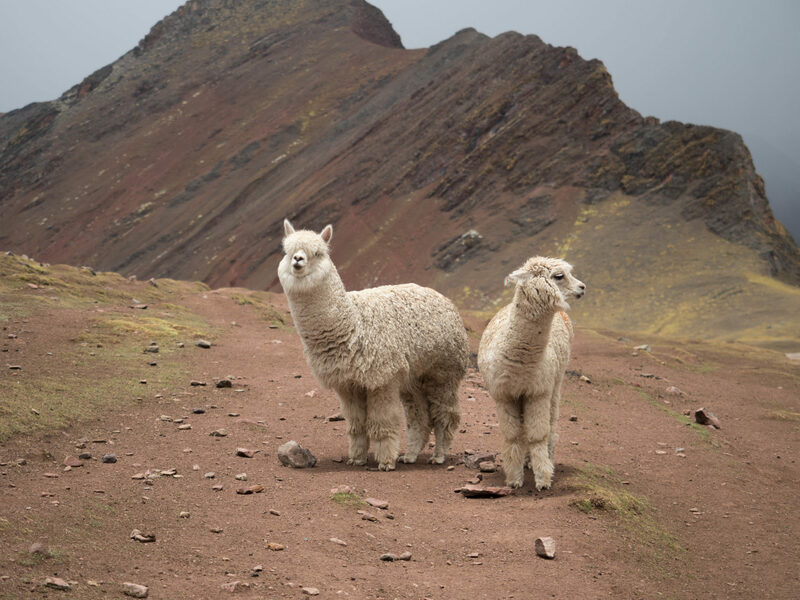 Keep a lookout for alpacas and llamas, you’ll pass several along the way. Tip: The last 1/3 of the drive is on a windy dirt road that is all uphill. If you get motion sickness I recommend you bring something to help with that. 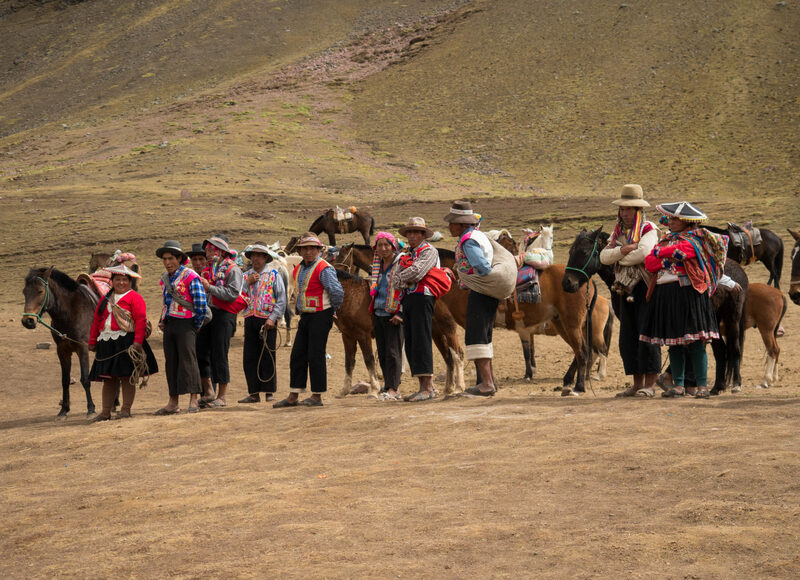 To make it more accessible to all types of travelers, or for those suffering from altitude sickness like me, you can pay for a horse and local guide to take you up the mountain. Now they can only take you about 3/4 of the way up, so you’re responsible for hiking the steepest part at the end on your own. The guide will also make you dismount and walk at certain places along the way that are steep. Not sure if you’ll need a horse? 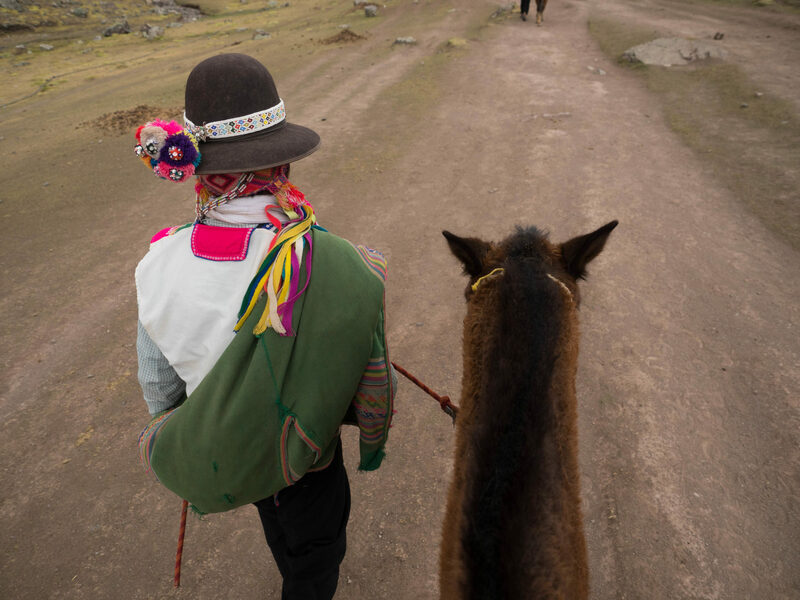 Luckily you can always attempt the hike on your own first, and then pick up a horse and guide along the way if you need one. They know tourists have a hard time with the altitude, so horses are spaced out at different points along the trail just in case. Try to coincide your hike on a day with good weather conditions. It can be strenuous enough without rain, sleet, and/or snow getting in your way. It’s a muddy trail to begin with, and when you add in these weather conditions it can be dangerous for even the most experienced hiker. Wet conditions also dull the colors of the mountain. 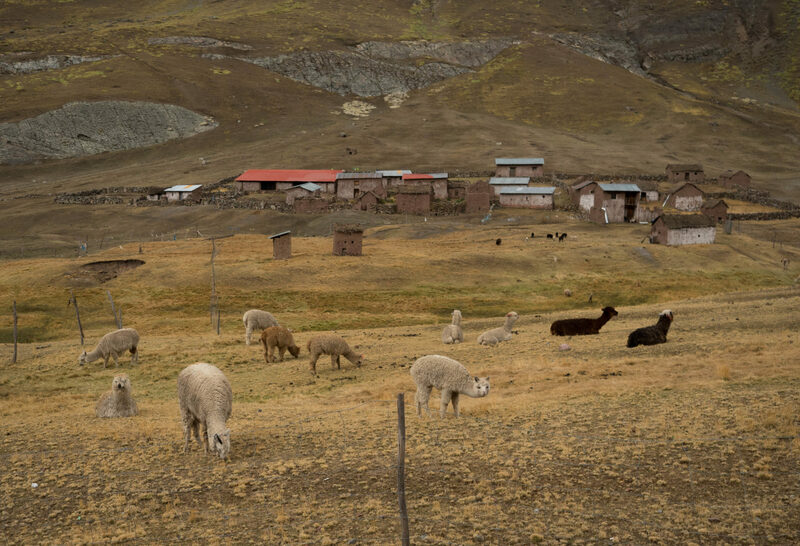 Tip: Keep in mind that the rainy season in Peru is November to March. Now rain can happen any time of year, but it’s more prevalent during these months. In the picture below, if you look in the distance you can see people making their way up the peak on the right-hand side. When you get to the top, turn around 180 degrees, and look toward the peak on the left-hand side. That’s the spot where you get the iconic view of rainbow mountain. 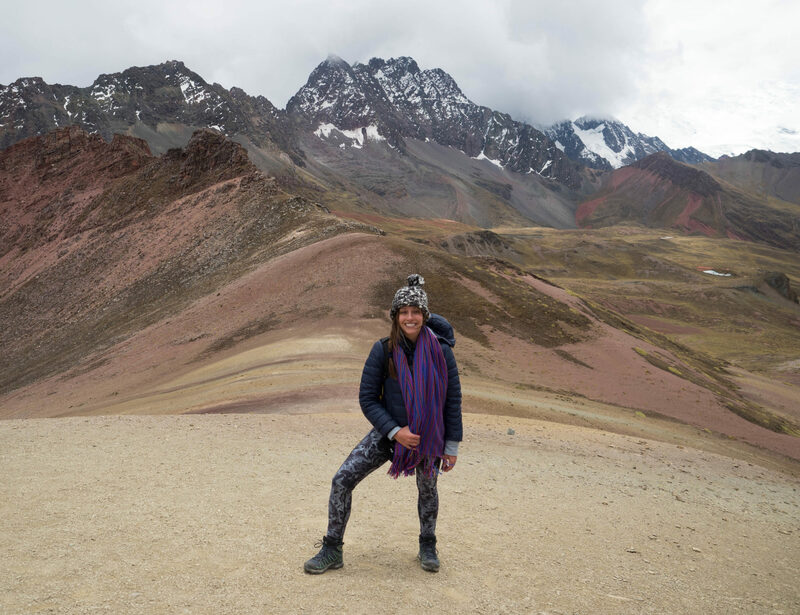 I went with the tour agency Marvelous Peru since it was recommended by my Airbnb host. The cost was 30 USD which included pick-up from my accommodation, bilingual guide, breakfast, lunch, entry into the national reserve (10 sol or 3 USD), and first aid/oxygen if needed. I thought this was a pretty good deal for the price. Tip: Shop around and book when you get there. 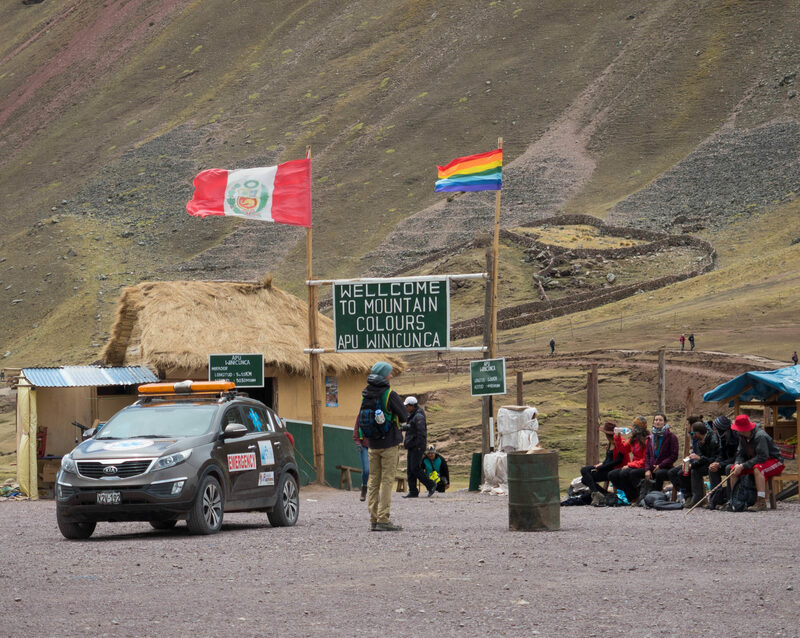 If you google “rainbow mountain tour” before you go, you’ll see some companies asking for as much as 200 USD. 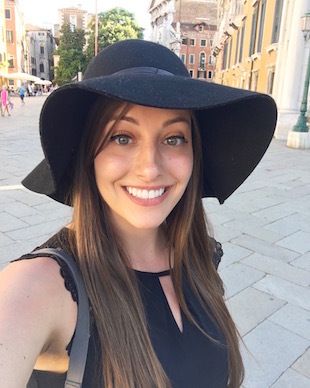 After speaking with a couple people on my bus, I noticed that not only did we book through different agencies, but we all paid different prices for the same exact trip. -Daypack with camera, rain jacket, warm clothing, hat, gloves, and scarf since weather can change quickly in the mountains. -Snacks and plenty of bottled water. 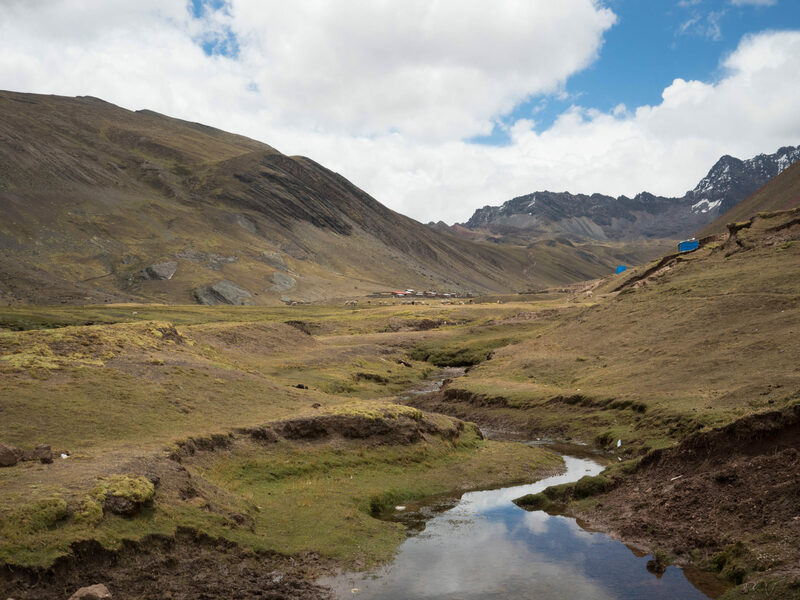 It’s not safe to drink tap water in Peru, so either buy bottled water or bring purifying tablets. -Cash in soles for snacks, coca tea, the restroom (more on this below), and tipping at the end of the tour. 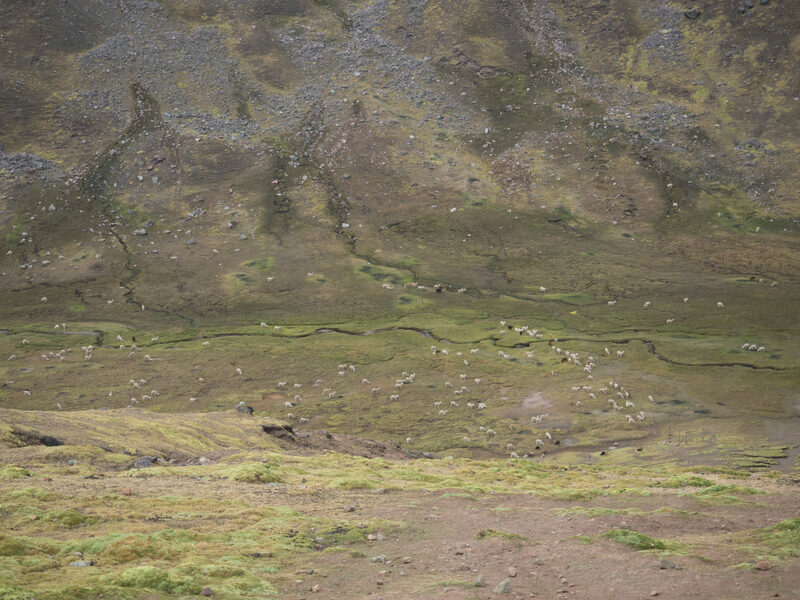 The hike itself isn’t very long (we were given 3 hours to complete the trek), but the altitude makes it challenging. 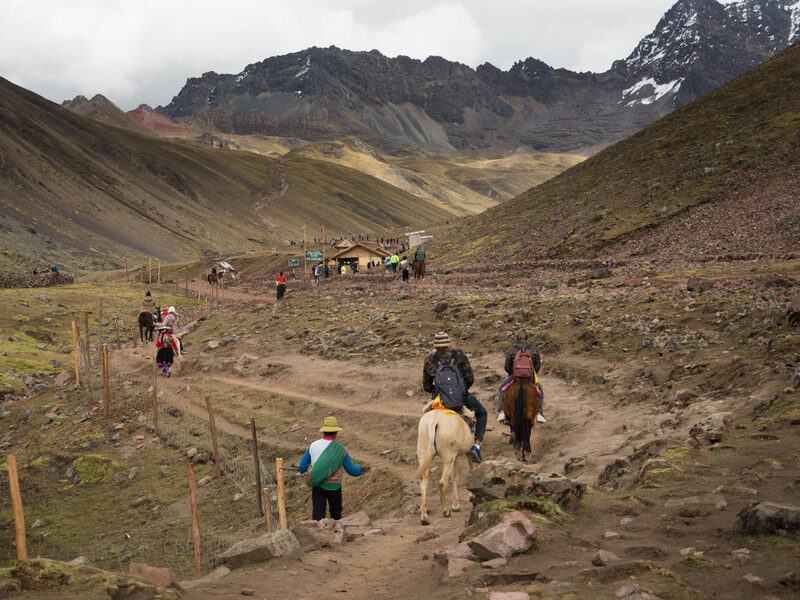 I would NOT recommend doing this hike right away when you arrive in Peru. 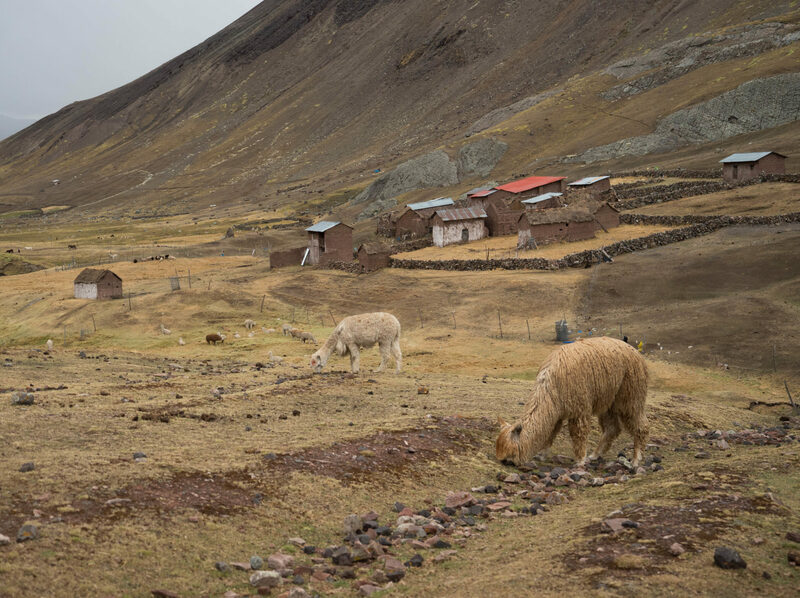 I’d suggest you spend a few days acclimatizing to the elevation of Cusco which is 11,152 feet, and then go to Machu Picchu before rainbow mountain. This will give you several days to acclimatize. Altitude sickness is no joke. My bus had to stop at a local clinic on the way back because one of the passengers got severely ill. Tip: Drink coca tea if you can, it does help. 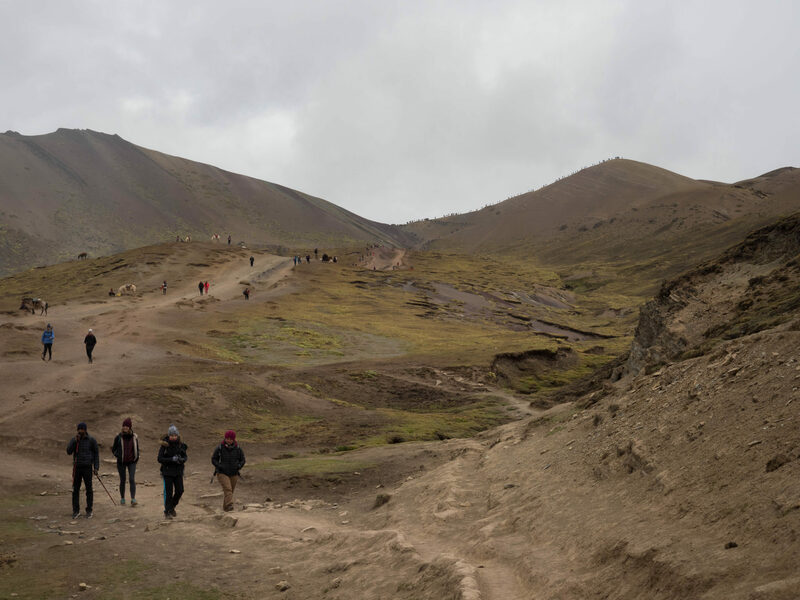 You can also ask your doctor about taking prescribed medication for altitude sickness before you go. 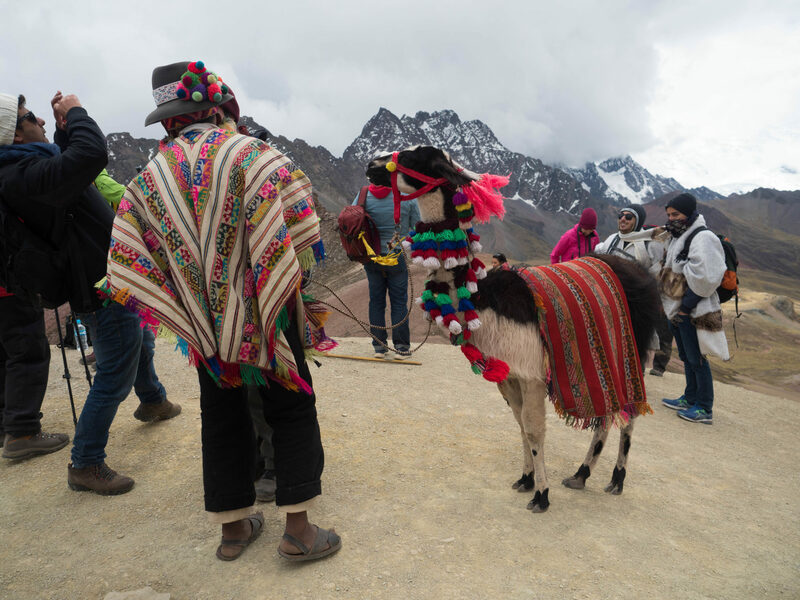 This local Peruvian and his llama are dressed to impress. Beware, if you take a picture you’ll have to pay. My day to rainbow mountain began at 2:45 AM when my alarm went off. I was told to wait on the street outside of my Airbnb at 3:45 AM and that someone would pick me up by 4:00 AM. As I waited outside I got to witness some drunk tourists stumbling home, and then sure enough a young Peruvian boy came running up the street at 4:00 AM to pick me up. He guided me to the bus waiting at the bottom of the street. Drop off can be anywhere from 7-9 PM depending on how many stops you have to make. Keep in mind they drop you off at the city center and not at your accommodation on the way back. Breakfast: We stopped at a small village for breakfast about 2.5 hours into the drive. Breakfast was included in the price and consisted of bread served with butter and jam. If you need something more substantial I’d recommend you pack your own. They also served coca tea and coffee. Lunch: Provided at the same place on the drive back. One thing I didn’t realize was how late we’d be eating lunch. It’s served late in the afternoon and is actually more of an early dinner in my opinion. Tip: Bring snacks! I can’t stress this enough. There are many opportunities to buy snacks before you start the hike. Either from one of the vendors during a restroom break or at the trailhead from one of the locals. Make sure to use the restroom any chance you get. Once you get out of the city bathrooms usually consist of a hole in the ground that you have to squat over. You’ll also need to bring your own toilet paper, wet wipes, and hand sanitizer. Once you start the hike there’re two outhouses about half way up. That’s it. So if you have to go at any other point along the trail you’re really out of luck. Tip: Always carry small coins with you. They charge around 1 sol to use the bathroom everywhere you go. 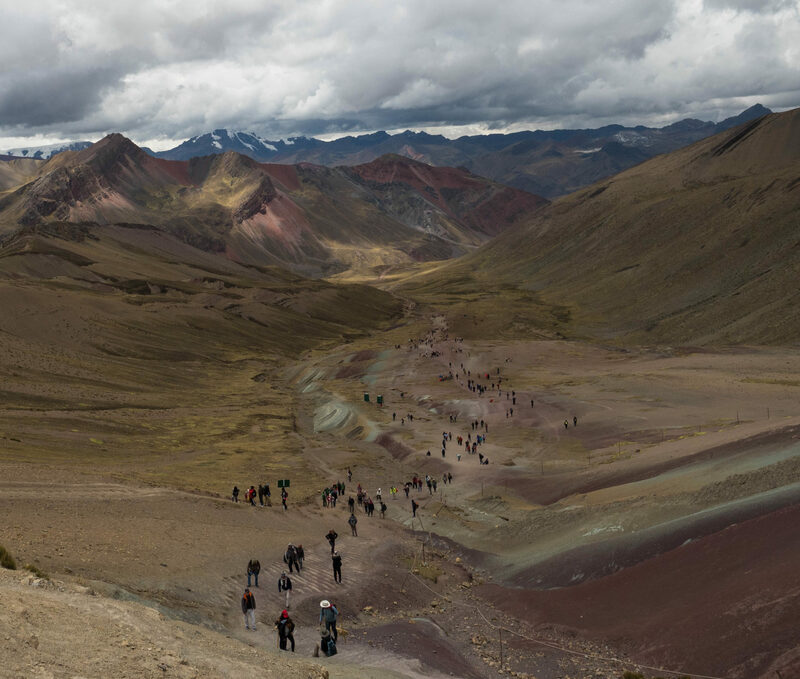 The photographs are incredible of the trek to Rainbow Mountain – learned a lot through this post! Had no idea that this site has recently been identified and guided tours are new to the area! So cool! I want to go!! !